The test tools in Visual Studio can help you stress test your application. The only problem is that they are not included with the regular developer edition of Visual Studio. So if have the wrong version installed you need to uninstall and reinstall a version that does have those project types (like Team Suite). What I found though was after you uninstalled and reinstalled you were not able to open/create test projects. The project types were there, but you receive an error: The following project languages must be installed C#, C++, VB.NET (or something like that). Everything else will work, but the test project template. 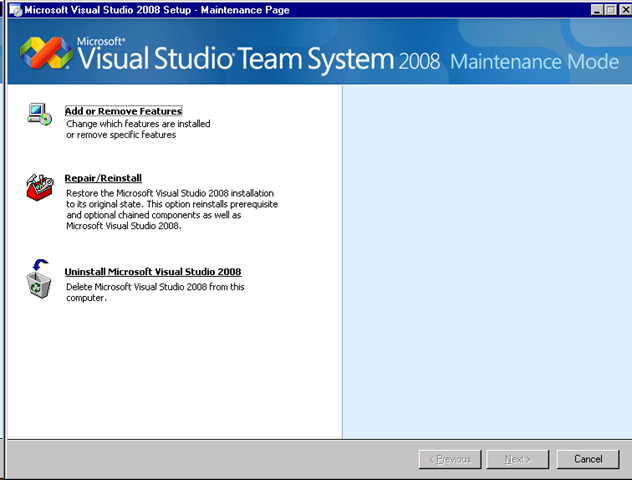 What you have to do in go to Control Panel –> Programs and Features (or add/remove programs) and do a Repair/Reinstall on your install of Visual Studio. After that finishes you can now open/create test projects. This entry was posted in Visual Studio and tagged .NET, Component Frameworks, Control Panel, Languages, Microsoft Visual Studio, Programming, Tools, Visual Studio. Bookmark the permalink.